(4.2/5) Pet Feedster USA PF-10 CAT, is the improved version of the Pet Feedster Pet Feeder specially designed to feed your mischievous cat. If you are looking for a cat proof electronic feeder you must pay special attention to the chute. The Pet Feedster USA PF-10 CAT features an added chute protector to prevent your cat from getting extra meals, you don’t have to worry if your cat has the feeder “figured out” by pulling kibble out with its paws; your feline friend simply won’t be able to help himself extra food. The unit also features a refined Flex-Feeder to make it more suitable to dispense cat kibble size. The patented Flex-Feeder is an internal piece that rotates and dispenses the food into the tray. The Flex-Feeder piece can be adjusted to the kibble size your cat eats, from 1/8” up to 3/4” diameter. 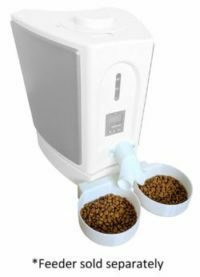 The feeder can be programmed to dispense from 1 up to 5 meals per day, each meal from 1 teaspoon up to 6 cups of food at a time, depending on the kibble size. The unit allows you to adjust the meal size individually, for example, big breakfast and small lunches. The feeder does not lose the programming when unplugged, power outages or when changing batteries. NOTE: On the end of this review you will find the new features added to the new release of the Pet Feedster PF-10 PLUS CAT and the new accessory Two-Way Two Bowls attachment specially designed to feed two cats! Ability to dispense from 1 up to 5 meals p/day. A range of meal size from 1 teaspoon up to 6 cups dry food at a time, depending on kibble size. Backlit LCD screen when pressing a button for easy reading. It runs on AC/DC power or 6 x D size batteries (alkaline last up to 6 months). It can be powered by both AC/DC Adapter and batteries simultaneously as a backup in case of power outages. No need to re-program. It retains all the programming if unplugged, power outages or changing batteries. If you unplug it without using batteries, you only need to reprogram the clock. Ant-proof, with removable water tray at the bottom of the unit to protect food from ants and other bugs. 1-year manufacturer’s limited warranty on any mechanical or electrical issues. 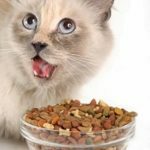 The programming is based on 2 steps: determining how much food you want your cat to eat at each meal and how many times you want your cat(s) to eat per day and the feeding schedule. Learn more about how to assemble and program the unit with easy steps. HOW DOES THE POWER BACKUP SYSTEM WORK? You can use AC/DC adapter plugged into a 110 Volt outlet or you can run the unit on 6 D size batteries. When using only AC/DC adapter, if a power outage occurs the unit will retain all the programming (internal timer) but of course it won’t dispense food during that time without batteries. If you unplug the unit and the feeder doesn’t have backup batteries you only need to reprogram the clock. If you use the battery backup and a power outage happens, as the Pet Feedster can run on both AC/DC adapter and batteries simultaneously, you’ll have peace of mind your pet will always be fed. If the electricity fails, the batteries take over and ensure your cat meal time. The AC/DC adapter runs at a safe low voltage current, being also energy efficient. The unit’s power cord is UL listed and it’s 68” long. The Pet Feedster for cats handles kibble from 1/8” to 3/4” diameter size and kibble shapes like triangle, flower, stars, rounded spherical, flat, etc. To get the best accuracy with irregular-shaped kibble simply adjust the Flex Feeder to a little wider size than the kibbles. When using irregular-shaped kibble you may notice the amount of food on each meal may vary a little bit. This usually happens when programming the feeder with very little amount of kibble at a time, but know that the total amount of food dispensed at the end of the day will be the same; the motor turns only so many times, so if you notice some kibble on breakfast are missing, they’ll be dispensed in next meal. WHAT ARE THE PROS AND CONS OF THE PET FEEDSTER FOR CATS? Reliability. It gives you peace of mind while at work, on trips or if you want to recover those missing morning sleeps at 5 am. Cat-proof. With special chute to prevent kibble theft and designed to keep away the cat’s paws. Power backup system that runs on both AC/DC adapter and batteries at the same time, ensuring the operation if power outages up to 6 months with new alkaline batteries. Refined auger (Flex-Feeder) designed to feed a large range of cat food shapes, types, and sizes. Portions sizes can be customized individually with accuracy, preventing over-feedings. 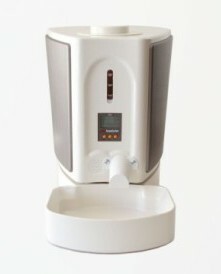 Ability to dispense from 1 teaspoon up to 6 cups of food at a time, depending on size kibble. Capacity to retains all the programming if unplugged, you don’t need to re-program. If unplugged with no batteries you only need to reprogram the clock. Removable food bowl allows you to place a stainless steel bowl if your cat is allergic. 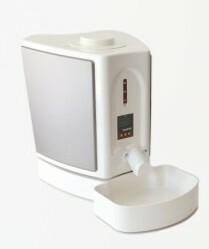 Ant-proof, it features a reservoir case or moat underneath the unit to protect the food. Hopper is not transparent, which helps cats not to get anxious looking at the food. Programming is not intuitive, you have to adjust the meal sizes but you’ll do it only once in the beginning. Instructions to program the feeder are not 100% clear but this YouTube video makes it easier. The unit has a large footprint, this is a disadvantage if you don’t have enough room. Use water and vinegar on the bottom tray to keep ants away. If living in a hot humid climate, open the hopper and stir the food once in a while. Also, if your food clumps due to humidity, adjust the Flex-Feeder to a wider size and reduce the number of seconds for each meal. If want the feeder outside and you have raccoons in the area, strap the unit down to prevent them from opening it or knocking it over. If your cat is allergic to plastic you can change the bowl and replace it. See a video here (US link) a customer is using a ceramic dish instead of the bowl. The Pet Feedster CAT is the adapted version of the Pet Feedster Automatic Pet Feeder, made specially to feed cats. The unit features an improved Flex-Feeder auger to make it more accurate and durable, preventing it from breaking after a year or so of constant use. 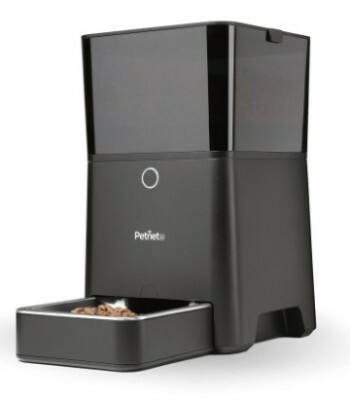 This newest version has a better accuracy in dispensing portions of cat food and a more refined “spindly” Flex-Feeder. Cats that need to eat a small total amount of food distributed in several small portions, up to 5. If you want a cheaper feeder for 2 cats that don’t need a strict accuracy in portions or several meals a day. If you don’t want to measure meal portions to program the feeder. The new release of the Pet Feedster offers the same great features of the previous version, but this new release adds excellent new features that make it even easier to manage your cat’s feeding activity. Meal Confirmation: The timer display shows you when a meal has been served, so you have peace of mind that your cat ate his meal. Pause Mode: Ability to put your Pet Feedster’s programming on hold without reprogramming, this is an excellent feature if you don’t want the unit to operate for a certain amount of time. Strengthened patented technology that is jam-proof. Same capacity to hold dry food, 10 lbs. If you like this new release even better, I highly recommend you to try it. The new Two-Way Splitter and bowl attachment makes the Pet Feedster the best feeder to feed two cats. 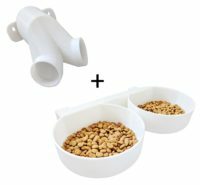 This great accessory allows you to feed your cats individually, avoiding food competition and providing each cat the comfort of eating from their own bowl, both cats getting the food at the same time. 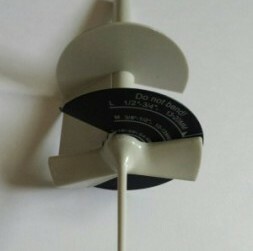 This accessory is sold separately from the feeder and it’s compatible with the Pet Feedster PF-10 CAT and PF-10 PLUS CAT. It’s recommended not to dispense more than 1 cup of dry food per bowl daily. Each bowl gets almost the same portion, within 5%. The Two-Way splitters are made from the same strong ABS material the feeder is made of and they are easy to clean by hand. If you have two cats and have always thought about a having a splitter for your feeder but couldn’t DIY, Pet Feedster did it for you.